The Football Association must follow Germany and the Netherlands by focusing on youth coaching after their early exit from the 2014 World Cup, says former England boss Steve McClaren. McClaren was in charge for England's failed bid to reach Euro 2008 and has managed clubs in all three countries. 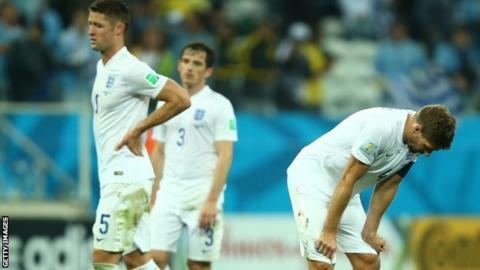 "Coaching is not respected enough in England," he told BBC Radio 5 live. "The problem at the World Cup was simple. Our players weren't good enough and haven't been for many years." Defeats by Italy and Uruguay in Brazil meant it was the first time England had been knocked out in the group stages since 1958 and the first time they had been eliminated after only two matches. McClaren, 53, resurrected his career in the Netherlands where he won the title with FC Twente after he was sacked from the England job. He spent an ill-fated nine months in the Bundesliga with Wolfsburg, then returned to Twente for a second spell in January 2012 and is now at Derby, whom he guided to the Championship play-off final in his first season in charge, only to be beaten by Queens Park Rangers. Speaking on Sunday's Sportsweek, McClaren said the German and Dutch associations concentrated "not on facilities, but on coaching the coaches who coached the kids at a very young level". He added: "We need to make better players. I am talking from eight, nine and 10. You do that with better coaches. "We don't just need to teach players how to play football. They need to be taught about game management." The FA implemented new rules for youth football two years ago in an effort to raise standards. However, former FA chairman David Bernstein said the organisation was "outdated" and suffered from too much influence from the Premier League. "I'd like to see some act of parliamentary or regulatory control to sort it out and make fundamental change," he said. "Progress is so slow - we are always behind. We seem to have the same debate every four years."